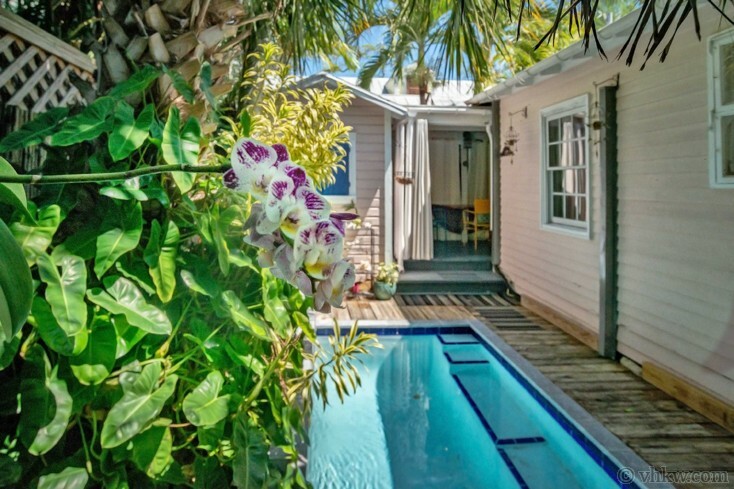 Ideally situated on famous Southard St., in the Historic Seaport side of Old Town, this historic Key West cottage is nestled in one of the island’s most charming and interesting residential neighborhoods. Handcrafted with heart-pine wood, and capturing true Caribbean character, this colorful saw-tooth roof abode, carries an authenticity that you generally only hope to find in The Bahamas or further down-island. In the pool garden. 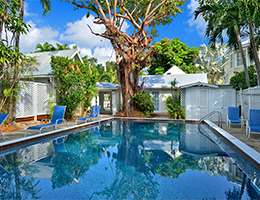 For anyone who wants to experience the essence of Key West tropical living, this unique home will bring you to the heart-and-soul. 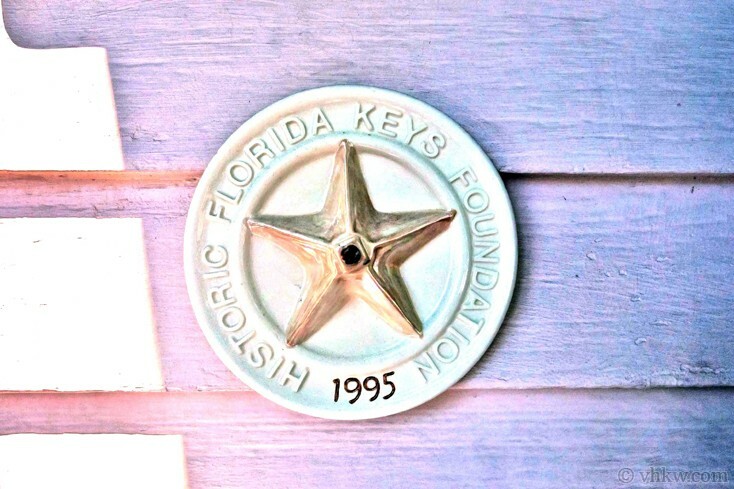 Originally built in 1860, a restoration in the early 1990’s, won it the coveted Star Award by the Historic Florida Keys Foundation, in 1995. Its unique character has so captured lovers of Key West homes and gardens, that it’s been featured in two books - Mary Emmerling’s American Country Cottages, 1993, and again in Key West Gardens and Their Stories, Frawley-Holler, 2000. As one would expect, many updates and comfort amenities have been made over the decades, including a lovely dipping pool with trickling waterfall and wooden deck. 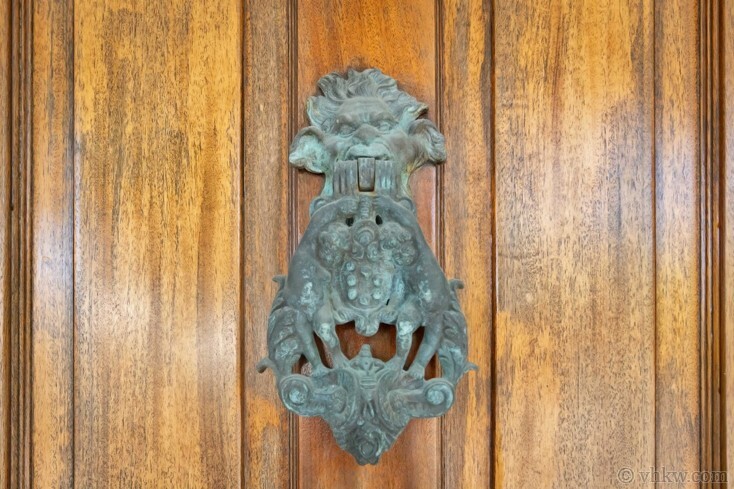 Fortunately, renovations have respected and ultimately maintained the important historic architectural aspects of the house, such as the original heart-pine floors and walls. And the most noteworthy feature (and for me the most endearing) is the detached Caribbean style cookhouse! But before we get into the cookhouse indoor-outdoor tropical lifestyle, let's explore the interior layout of the cottage and enjoy the décor and features it offers room-by-room. We begin our tour curbside at the front of the house, where craftsman story-book qualities and beautiful colors create a delightful scene. A 12-foot high porch ceiling is painted haint blue and topped with a pronounced saw-tooth roof. 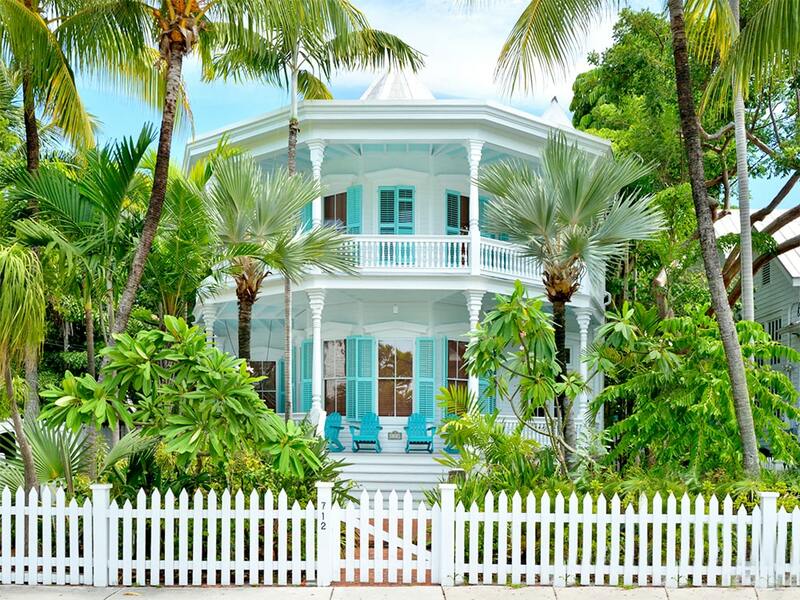 Pink wood-slat siding, periwinkle blue window shutters, and a sitting porch spanning the width of the house, create an outside setting perfect for watching the world of Key West go by. Wide-sash six-pane wood windows are set symmetrically on either side of the varnished wood front door (complete with patina bronze knocker), and a seafaring lantern hangs in the center of the porch ceiling. The front door steps directly into the living room, which spans the entire width of the cottage. A sofa, two easy chairs, and coffee table are staged towards the front of the room, while straight ahead at the back of the room, we see the entertainment armoire which holds a 32-inch flat-screen TV. Opposite the armoire, is a wood and wicker café table and chairs. The front room space is made pretty with historic pine floors restored and varnished, and the walls are painted sea-foam blue with white trim. 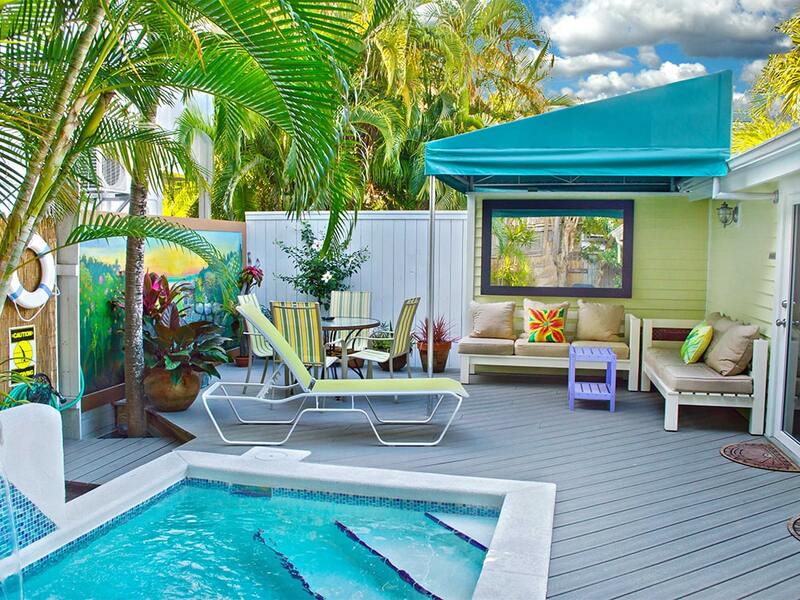 Comfortable tropical-style furnishings and white linen window curtains keep with an island theme. Directly adjoining the living room, to the left of the front door, we find the pretty master bedroom. Enter through double wooden French doors, to find another light filled room, with the same wide sash windows and linen curtains as the living room. Original pine walls are painted in lemon yellow with white trim, and furnishings include a queen size bed with side tables on one end, and a bureau on the other. There is also a built-in closet. A doorway next to the bureau, leads to the en-suite bathroom. 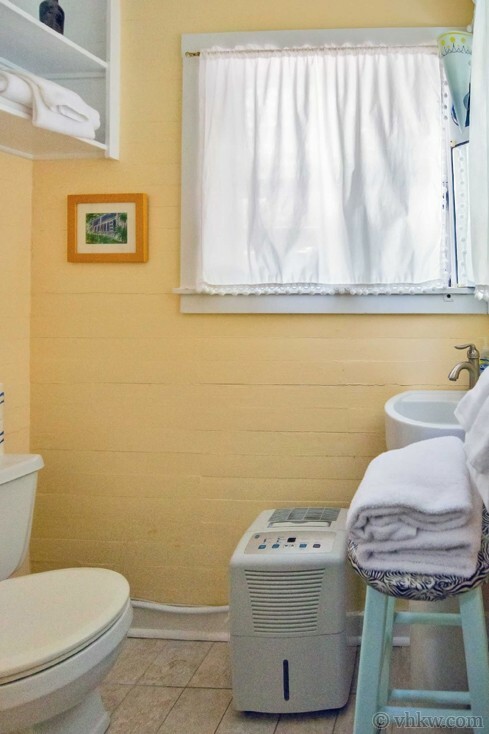 The bathroom is nicely done up with modern fixtures, yet the wooden vanity and glass vessel sink tie nicely in with the historic wooden walls painted yellow to match the bedroom. The single person shower is finished in blue mosaic tiles. Returning to the living room, we walk towards the back of the house to find a doorway leading to the dining area, second bedroom, cookhouse, and pool-garden. 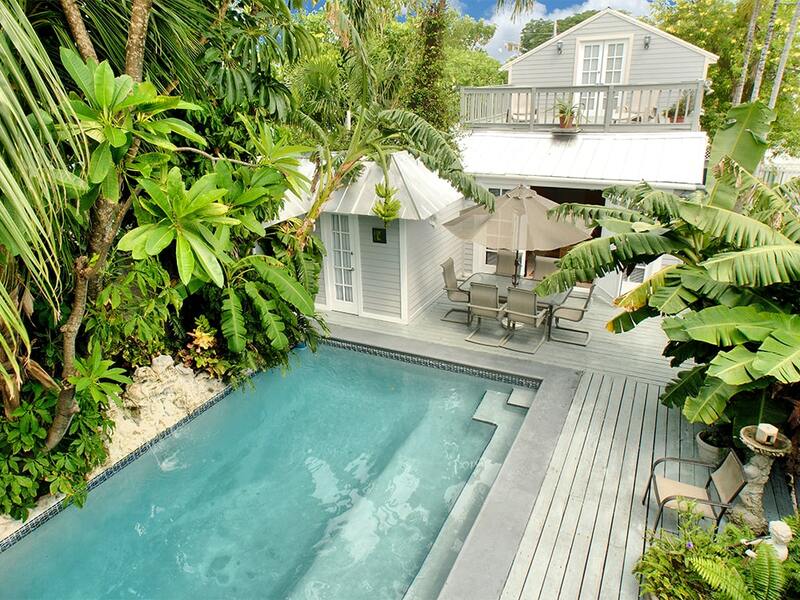 This is where the cottage design epitomizes the tropical island lifestyle and becomes fun. Immediately through the door joining the living room, is a charming covered breezeway that doubles as the al-fresco dining room. Canvas curtains are hung on both sides and serve to nicely close off the room if you choose to do so, creating an indoor / outdoor dining space. Another seafaring style lantern above wooden drop-leaf dining table maintain the historic nautical ambiance. Before we proceed to the cookhouse, let’s pass through the doors directly across from the dining table, and look at the second bedroom, with en-suite sink and commode. 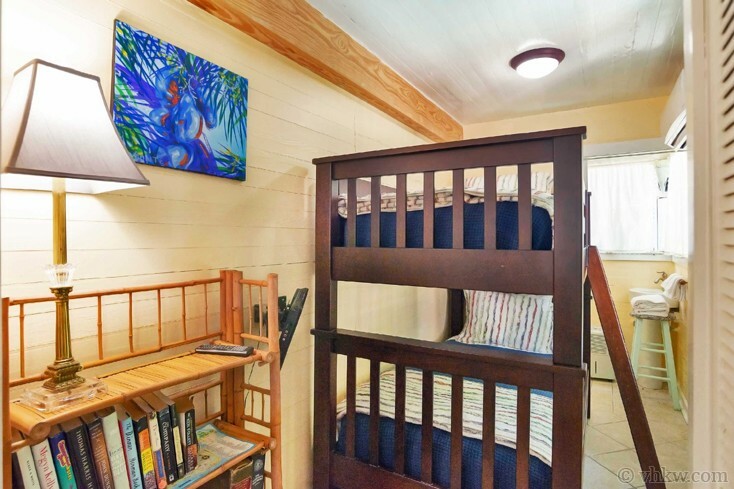 Set up as a fun tropical style bunk-room, this bedroom provides a set of wood slat twin-size (single) bunk beds, a TV, and a book shelf with small library. Back out to the dining area, we turn left and head to the Caribbean style kitchen. The concept of the 'adjacent cookhouse' was a standard design in the tropics when this cottage was originally built in the 1880’s. In those days, this layout was meant to be strictly functional – to protect the main house from the kitchen heat and smells. Today, it’s as fun as it is functional, creating a unique space to cook in, that enhances an authentic ambiance which most people appreciate once they’ve experienced it. The artisan features of the cookhouse include the charm you would hope to find in this historic cottage - including hand-built wooden counter tops, open beamed ceilings, a full-size ceramic sink with classic nickel fixtures, and large farm-house style window with adorable view of the pool-garden. You’ll find everything you need to prep and cook in the kitchen, including a gas stove and oven, and full-size refrigerator. Open shelving constructed to a window invites in the light, and the window over the kitchen sink offers a charming view of the pool garden and deck. From this little cookhouse, it’s easy to keep an eye on whomever is in the pool, and since it’s connected with the main house via a covered breezeway, there is really no inconvenience to this layout. Finally, we step outside to experience the exotic pool-garden, offering a dipping pool with trickling waterfall, and a small wooden deck. Completely fenced in, the pool backdrop is lushly planted garden with palm trees and a beautiful variety of tropical foliage. 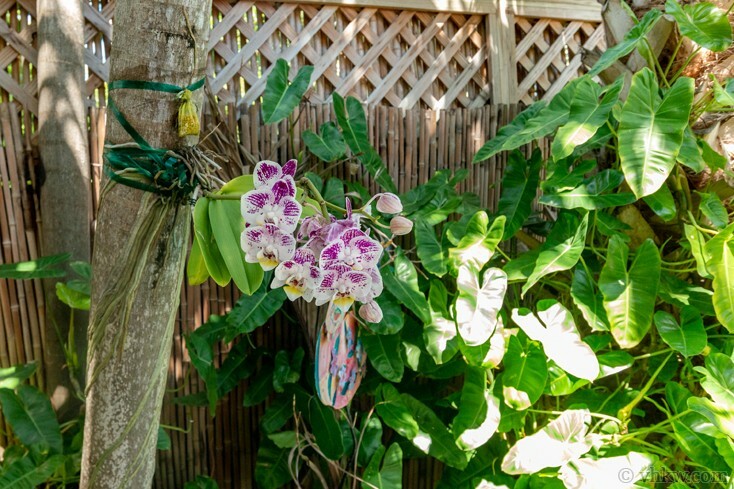 Established orchids wind their roots around the tree trunks, and it’s really magical when they bloom. Walking past the pool, to the other side of the garden, the wood deck narrows, but there is plenty of room to walk to the other side where it widens again. 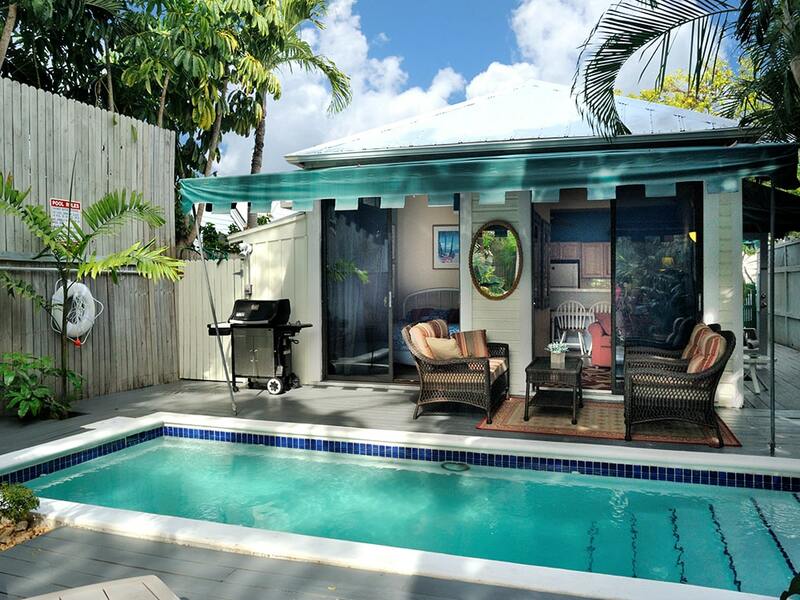 At the corner, we find the BBQ grill, and outdoor dining set. Where the deck rounds the corner of the house, you’ll find the laundry closet plus another fun feature - an outdoor pool-shower. The outdoor shower offers hot and cold water, and since it’s located on the outside wall from the bunkhouse bedroom it can serve as a shower for that bedroom. From this side of the yard, there is also a garden gate leading out to the front of the property on Southard Street. 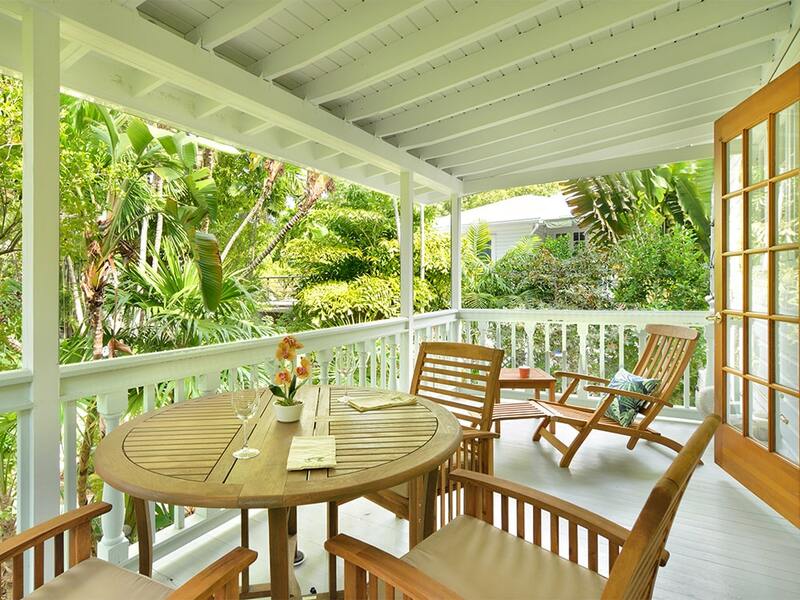 Now that we’re back to the front of the cottage, where we began our tour, you’ll notice that the yard is fenced with the quintessential Key West white picket fence plus porch railing and is lushly landscaped to complete the perfect historic conch hideaway. Amenities: Artistic renovation. Caribbean cookhouse style equipped kitchen, private dipping pool and deck (optional heat), BBQ grill, ductless central a/c, washer / dryer, 32-inch flat-screen TV’s in master bedroom, small TV in bunk bedroom. Linens and towels provided. Area: Charming historic Southard Street, with unique handcrafted wooden houses from every view point. 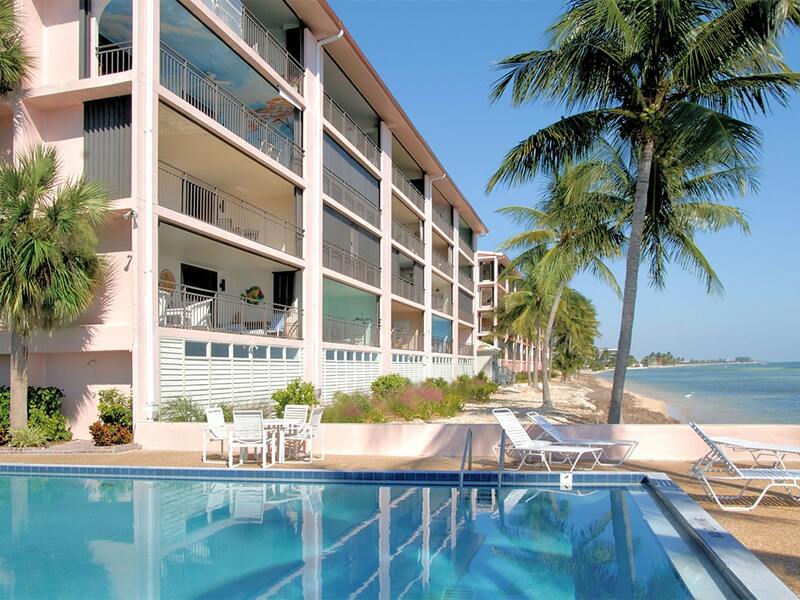 This house is in the famous historic Old Town Key West waterfront on the gulf side of the island. Here the founding fathers and mothers of the late 1800’s built the first stately homes that stand today as one of the largest and most impressive collection of turn-of-the-century architecture. From larger Greek Revival Victorians to charming cottages, many of these alluring structures have been restored and renovated to stand in their gleaming glory. 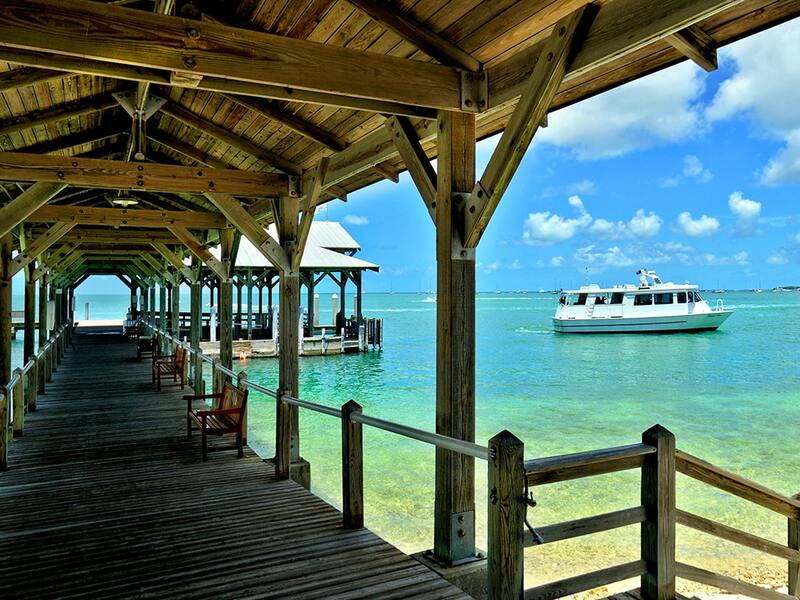 Along the Key West Harbor, early business magnates-built shipping docks, warehouses, and fish processing plants. Today this district includes famous waterfront restaurants and bars, retail stores, museums, fishing and sailing charters, a large variety of historic homes.